With Ben Roethlisberger under center, the Pittsburgh Steelers would’ve been favored by 4 points over the rival Baltimore Ravens in today’s “Thursday Night Football” game at Heinz Field. With Ben Roethlisberger under center, the Pittsburgh Steelers would’ve been favored by 4 points over the rival Baltimore Ravens in today’s “Thursday Night Football” game (5:25 p.m., CBS (8), NFLN (317)) at Heinz Field. But with Big Ben out with a knee injury and Michael Vick starting in his place, the winless Ravens are laying between 2½ and 3 points at Las Vegas sports books and most bettors are backing Baltimore. The total is between 43½ and 44. “All the money has been on the Baltimore Ravens,” South Point oddsmaker Jimmy Vaccaro said. “I think you’ll see a lot of Steelers money late. The first rush is coming on Baltimore and I don’t understand why. They can’t stop me or you the last couple of weeks. The Ravens, who eliminated Pittsburgh (2-1) from the playoffs last season at Heinz Field, are 0-3 for the first time in franchise history and desperate for a win as only three NFL teams have made the playoffs in the past 25 years after losing their first three games. Baltimore has lost its three games by a combined 14 points. 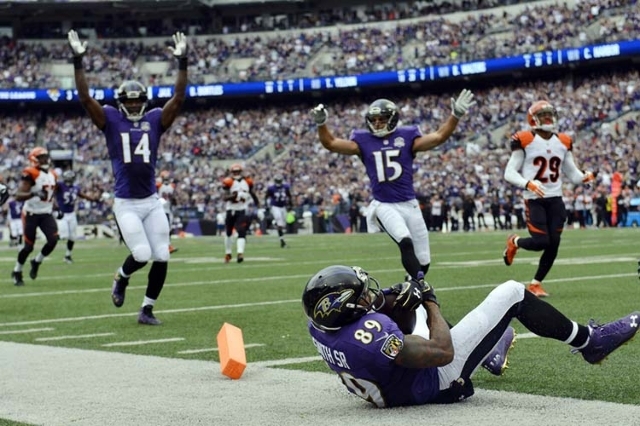 “I think you’ve got to look at (betting on) the Ravens,” handicapper Lee Sterling (ParamountSports.com) said. “They’re not what they were but with the familiarity Vick has with the playbook, which is probably not much, that’s going to be a problem for (Pittsburgh).